The Pokémon Company on Wednesday announced a new slate of Pokémon games for Nintendo's Switch console, two of which connect to Pokémon GO on iOS and another that will be available on Apple's mobile operating system later this fall. Revealed at a press conference in Japan, Pokmon: Let's Go, Pikachu! and Pokémon: Let's Go Eevee! are reimagined updates of the hit franchise entry Pokémon Yellow: Special Pikachu Edition, which debuted in 1998. Both games support integration with Pokémon GO on iOS, as players can capture and transfer over Pokémon captured in the Kanto region. Additional crossover features are expected to be announced as the games near release. Developed by Game Freak, the same studio that created Yellow, the Let's Go titles are nearly identical. At the start of each game, players take on a partner Pokémon that follows them throughout their journey of capturing, collecting and battling Pokémon. Depending on which version is purchased, users begin their quest with Pikachu or Eevee. There are also "some" differences in the species of Pokémon players stumble upon, and the rate at which they are encountered, based on game version, the company said. Designed to lure in new gamers, both Let's Go titles take full advantage of the Switch's intuitive Joy-Con controllers, allowing users to more capture Pokémon with a flick of the wrist or press of a button. Trainers can team up in multiplayer mode to catch Pokémon together. Separately, a new Poké Ball Plus accessory acts as a stand-in Joy-Con, complete with built-in LEDs, vibration feedback and sound effects. Players can also store Pokémon "inside" the ball and take them along as they go about their daily routines to accumulate various in-game rewards. 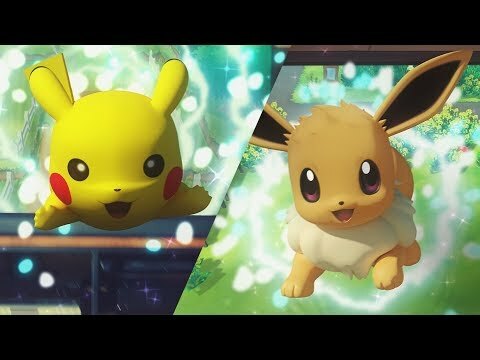 Pokémon: Let's Go, Pikachu!, Pokémon: Let's Go Eevee! and the Poké Ball Plus will be available on Nov. 16. Also on Wednesday, Nintendo released the free-to-play Pokémon Quest for Switch. Described as a "rambunctious action RPG," Quest puts players in charge of a group of cube-shaped Pokémon who inhabit "Tumblecube Island." The band of Pokémon roam about on their own in search of food and battles. At basecamps, players can level up and customize characters, as well as attract new Pokémon to their gang. 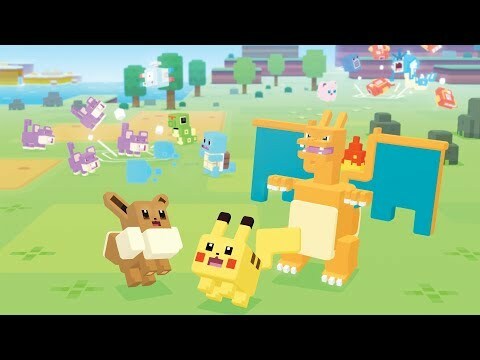 Pokémon Quest is due to arrive on iOS in late June. Finally, Nintendo offered a few new details on the next entry to its "core" Pokémon series, saying an as yet unnamed title will debut in late 2019. ARkit addition & Apple Watch integration has made Pokémon Go quite a staple on iOS. Personally though I don’t like it. Yes, and it seems with this new game The Pokemon Company has doubled down on Go. I don’t love the direction it’s going but it’s a smart decision because it pushes people to continue/return to playing Go and pushes Go players towards these new console releases but offer very familiar gameplay. Good new is another “core” Pokémon game is schedule to come in 2019 and more close resemble what we would expect from a mainline series entry. As you say later in the article, Pokemon Quest is coming to iOS in June, not the fall. As a fan of the originals in the ‘90s, I really don’t like that Go is being used as a model for now $60 almost “main line” games, particularly since Go isn’t even remotely a Pokémon game, or a game at all. it's kind of weird that the Pokemon company's take away from Pokemon Go wasn't that people like getting out and meeting other people who liked the games, or tracking down pokemon or anything like that... no they figure people just really liked timing a gesture with a progressively smaller on screen indicator ... I mean, don't get me wrong I'm gonna buy it. it's a remake of yellow. But I really hope they're not getting rid of the need to weaken pokemon before capturing them, and I also hope they're not going to get rid of battling wild pokemon. It's funny because fans keep saying they are okay with the changes in these games because the Pokemon Company has said a new actual mainline game is coming in 2019 that'll be similar to X and Y or Sun and Moon. To which I'm kinda like ... aside from the competitive play (like against other people) those games are still very much dumbed down RPGs. Like getting a game over in a pokemon game is practically impossible.